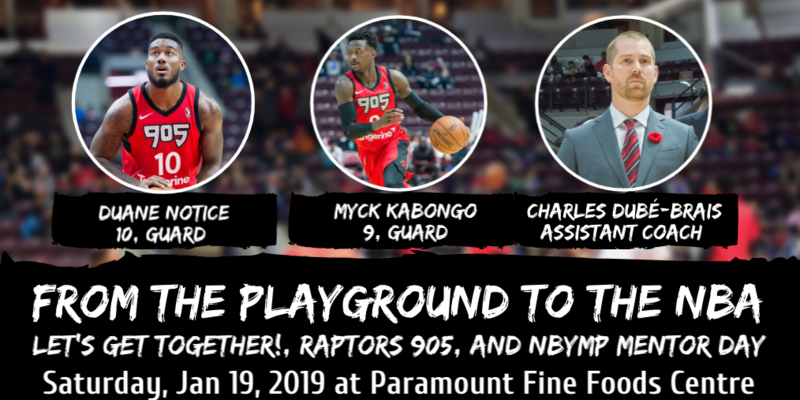 Join us for this one-of-a-kind family event called “From the Playground to the NBA,” taking place Saturday, January 19th at Paramount Fine Foods Centre in Mississauga. Meet Raptors 905 Players (and OBA Alumni!) Duane Notice and Myck Kabongo, Assistant Coach Charles Dubé-Brais AND their families, as they share their personal stories of success, failures and mentorship. The event is suitable for elementary age children and up and is organized by Let’s Get Together and the National Youth Basketball Mentorship Program. Prices start at $18 each and includes the Raptors 905 game vs the Greensboro Swarm, as well as all the activities and presentation. For group tickets (10+), please contact Dylan Cullis at dylan.cullis@mlse.com for more info. Written on 2018-12-03, in News. © 2019 Ontario Basketball Association.